The purpose of Imagine Jasper Avenue project was to envision an innovative, vibrant and relevant main street, between 109 Street to 124 Street, that balances the needs of the community, commuters, businesses and visitors. The project took place from September 2015 to March 2017, and involved four phases of public engagement. Participants were invited to view the renewed Jasper Avenue preferred design before it was presented to City Council on May 23, 2017. Ideas for design elements, including trash cans, street lights, benches and bus shelters, were shared, and child-friendly activities provided. The City held an open house to present the draft design options that were developed based on feedback from the public, business owners/operators and additional stakeholders. Technical studies and City policies were also used to develop the options. The public was invited to review and provide feedback on the draft design. 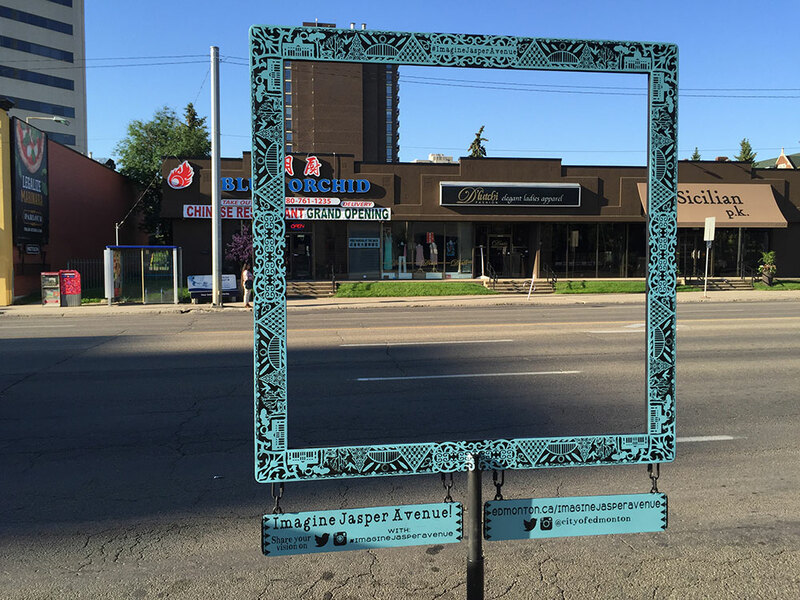 To help ‘frame’ the section of Jasper Avenue from 109 Street to 124 Street as Edmonton’s premier Main Street, the Imagine Jasper Avenue project partnered with CITYlab and local artist Naomi Pahl. Together, we created three interactive metal frame public art pieces. These frames invited the avenue’s users to look through them and start imagining what Jasper Avenue could be like as a Main Street. 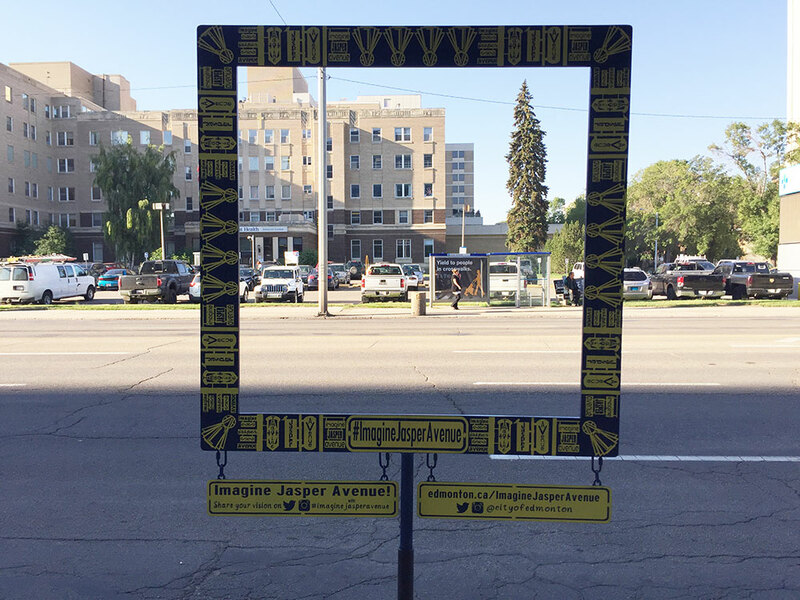 People were asked to look through the frame - take a picture - and ask themselves: ‘what do I currently see?’ and ‘what do I want to see?’ They then posted their pictures and comments to Twitter or Instagram with #ImagineJasperAvenue and @CityofEdmonton. City staff shared the themes from the comments and feedback received in the first stage of consultation. Through hands-on activities and discussion, participants learned about the factors that influenced future design options. At the open house and in the materials, the anticipated construction start year was incorrectly said to be 2018. The actual anticipated start of construction is 2019. 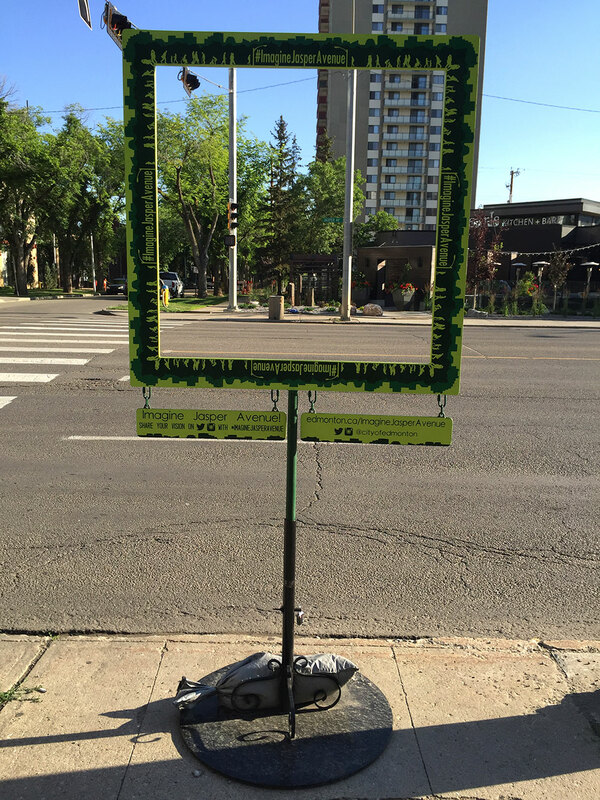 The vision for the street requires collaboration with the Edmonton community. The public was asked to get involved during the kick-off event as the project developed the guiding vision for the streetscape plan and a set of planning principles through a public engagement process. See a gallery of photos taken at the event. The Community, Business and Resident Committee (CBRC) was a group of people invited to act as representatives of the community, businesses, residents and stakeholder groups who may have an interest in Jasper Avenue. The CBRC was intended to act in an advisory role, assisting the Project Team (made up of City staff and consultants) in the development and testing of the Project Vision and design options. The CBRC was asked to provide background information and ‘local knowledge’ that the Project Team may not be aware of otherwise. The CBRC was also asked to provide feedback on public engagement materials and approaches.